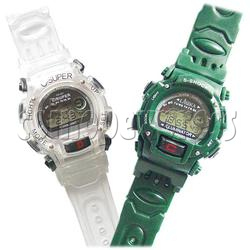 This is a series of EL sport watches, suitable for boy and girl. Push "D" or "C" button, dial will light with a two-color electro-luminescent backlight. Standard display: hour, minutes, seconds, a.m., p.m., month, date, week. Clear PVC band. Black, dark green, yellow, purple, pink and blue colorways are available. Standard display: hour, minute, second, a.m., p.m., month, date, week. 2 colors EL backlight function can keep 3 seconds. Minimum order quantity: can choose THREE different colors among 720 pieces. 20 pieces pack in an inner box, box size: W292 X D257 X H57 (mm) . 120 pieces per outer carton, carton size:W500 X D302 X H180 (mm), total 6 cartons for 720 pieces order.